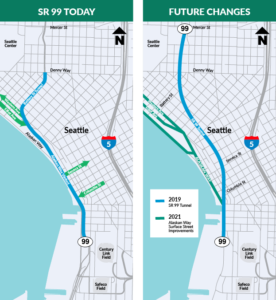 Monday/ here comes the SR-99 tunnel opening! The ‘Future’ is almost here. 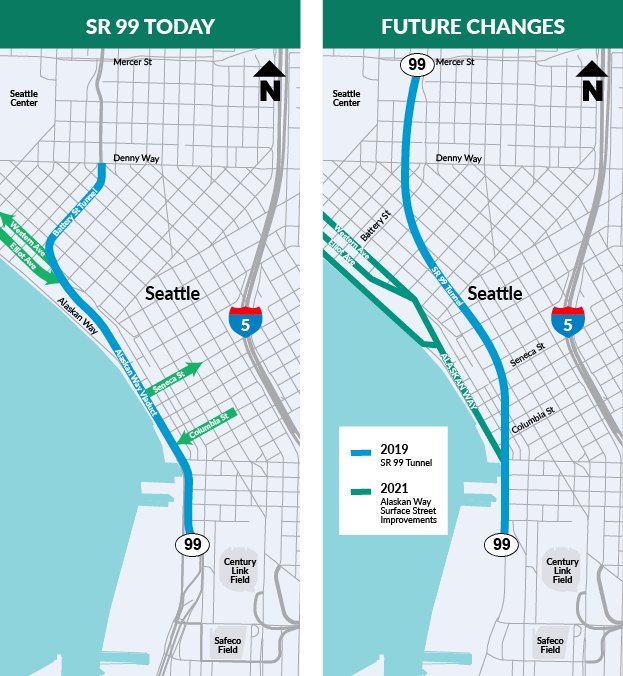 Here’s a before and after picture of the Viaduct and Tunnel. The tunnel is about 2 miles long. The excitement is building: the State Route 99 tunnel is still on track to open to traffic next Monday Feb 4. This Saturday & Sunday, some 100,000 people are expected to take part in a fun run, a bike ride and a walk (that would be me), through the tunnel. It’s been a long arduous time since Oct. 2011. 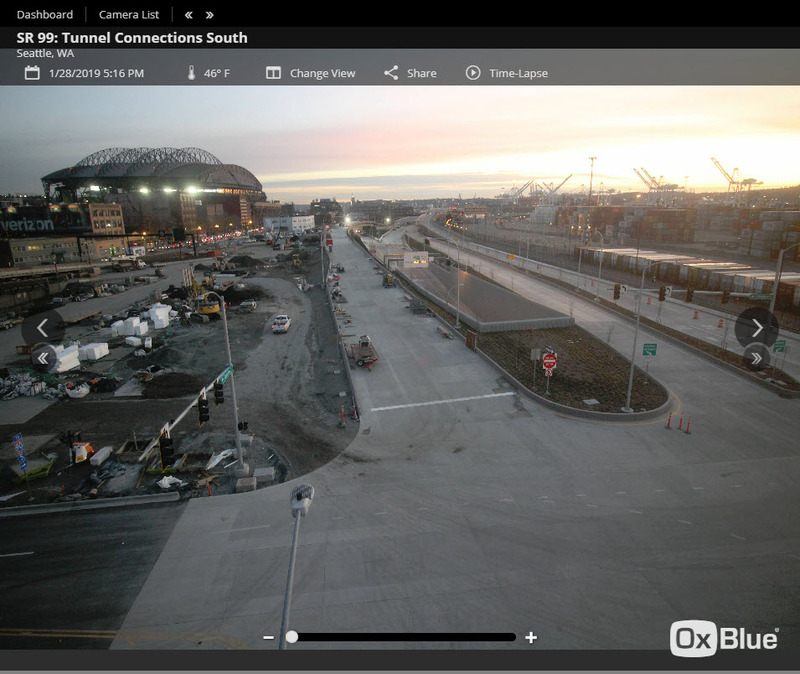 That is when part of the south end of the Alaskan Way Viaduct was demolished to establish the south portal of the tunnel, and install the ‘Bertha’ tunnel borer. 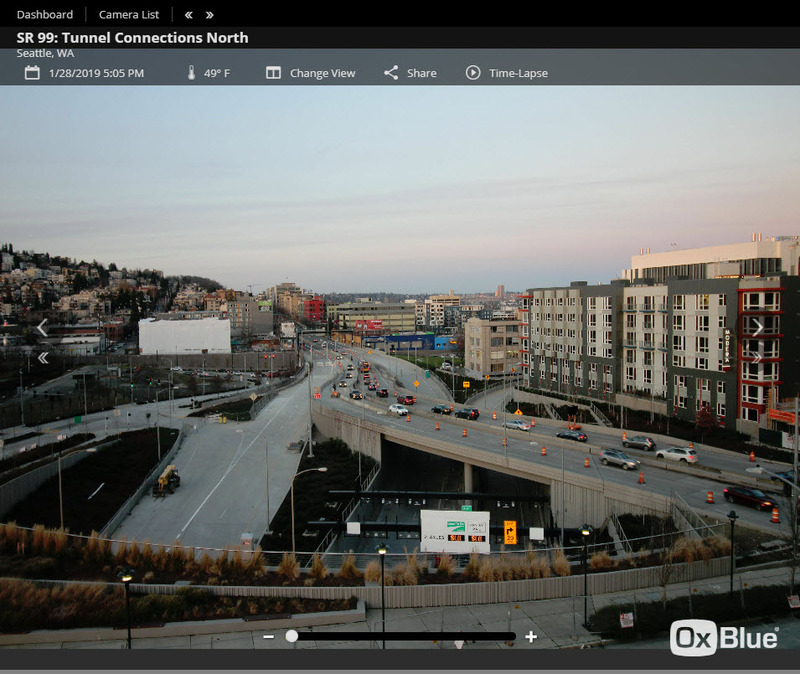 Then there was the breakdown of Bertha in Dec. 2013, after just 1,000 ft of boring. After all the setbacks, though, the cost overrun on a $3 billion project was only in the hundreds of millions. (These infrastructure projects are notorious for huge cost overruns. The Boston Big Dig started out as a $3 billion project, and ended up costing some $15 billion). 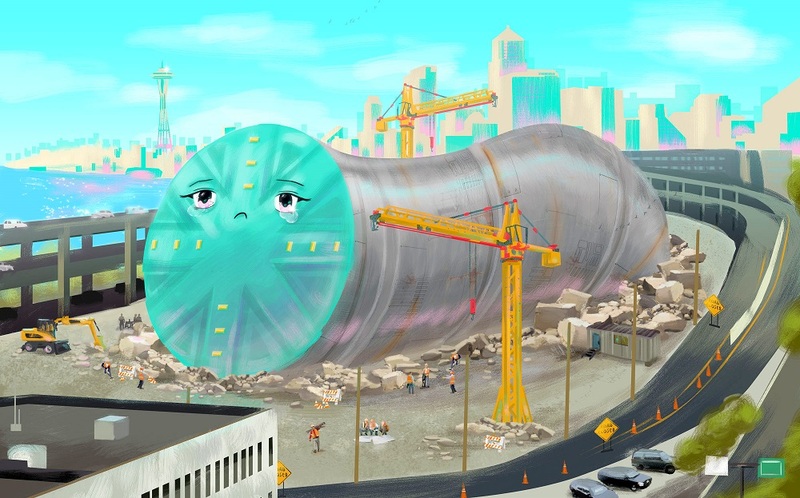 A ‘sad’ Bertha Tunnel Boring Machine depicted in a Bloomberg Business magazine article in March 2015, called ‘The Aggravating Adventures of a Gigantic Tunnel Drill’. Here’s the view towards the south, of the south portal (entrance & exit) of the tunnel, near the sport stadiums south of downtown. The tunnel opening is at the dipping road surface in the middle right of the picture. The big white geofoam blocks on the left were taken out of that hollow just these last two weeks. I hope the workers get to the striping of the street surfaces in time! 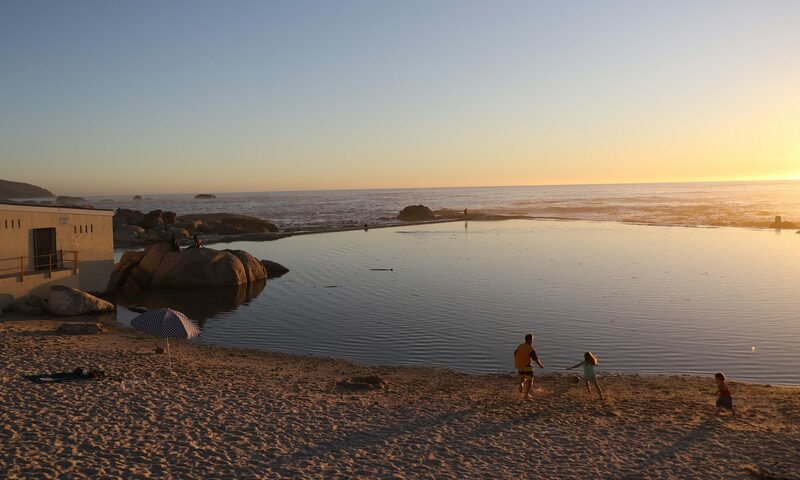 There is one more dry day in the weather forecast before the weekend. Again a view looking south, of the north portal near Seattle Center. 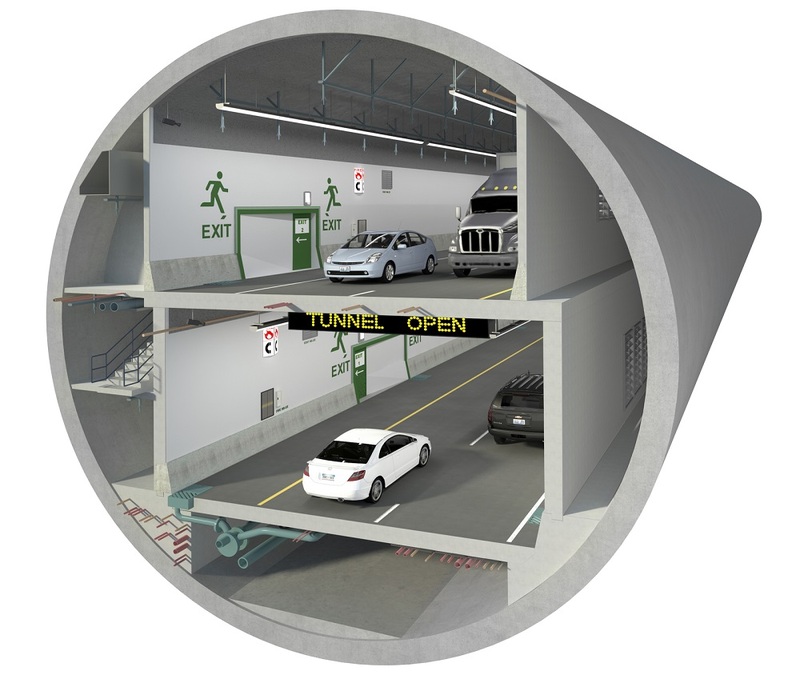 The tunnel will be free for the first few months, and then around July, toll fees of that range from $1 to $2.25 at rush hour, will be charged to drivers of cars.